Photo Courtesy of "Literary San Antonio"
The original Church of Nuestra Señora de la Candelaria y Guadalupe was built between 1728 and 1749 as the parish church of Villa San Fernando de Bexar, the first civil settlement in the Spanish province of Texas. By the mid-1860s the population of San Antonio had outgrown the original structure. The present building was begun in 1868 and incorporated the old church. Designed by Francis Girard, the church has twin towers and triple portals in the Gothic Revival style. 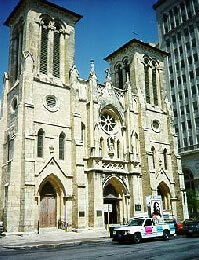 Renamed the San Fernando Cathedral, it became the seat of the Archdiocese of San Antonio. James Bowie, defender of the Alamo, was married in the original chapel and local tradition maintains that the remains of the defenders of the Alamo are buried in the new section of the cathedral. The San Fernando Cathedral is located at 115 Main Ave. between South Main and South Flores sts. in the Main and Military Plazas Historic District in San Antonio. The church welcomes visitors from 6:00am to 6:00pm daily. For further information call 210-227-1297 or visit the cathedral's website. San Fernando Cathedral has also been documented by the Historic American Buildings Survey.